For additional filter choices for your Vesta Ionizer, please visit Specialty Filters. The UltraWater filter has raised the bar on the water filtration industry with 99.9% reduction of an exhaustive list of the toughest to remove contaminants. 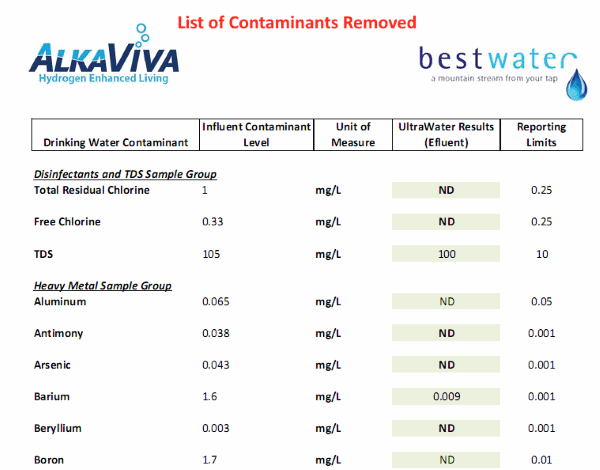 By using the newest cutting edge techniques, AlkaViva has created the first internal ionizer filter to reduce Fluoride and Arsenic to non-detectable levels in laboratory testing. Fluoride has long been difficult to remove from drinking water using traditional filters because the standard point of use fluoride filters require very slow flow rates, much too slow for an ionizer. AlkaViva’s commitment to not only healthy but clean and contaminant free water has lead us to new methods for reducing Fluoride and Arsenic that can be used effectively inside of an ionizer. Either of these filters can be purchased on their own. Please call us on 1877-770-5247 if you would like to buy either a Vesta UltraWater filter or Vesta Fluoride-Arsenic shield individually.